Have you or someone you know been in a car accident, motorcycle accident, slip/fall accident or any other accident. Get the answers to the questions you should ask yourself to protect your rights. Do I have to pay a lawyer up front to investigate and take my case? What if the person who caused the accident doesn't have insurance? Why is the insurance company saying it's my fault when the other driver got the ticket? 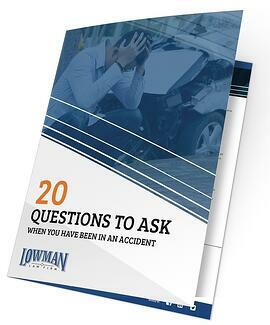 Fill out the form to the right and get the full guide including the 20 Questions to Ask When You Have Been In An Accident!